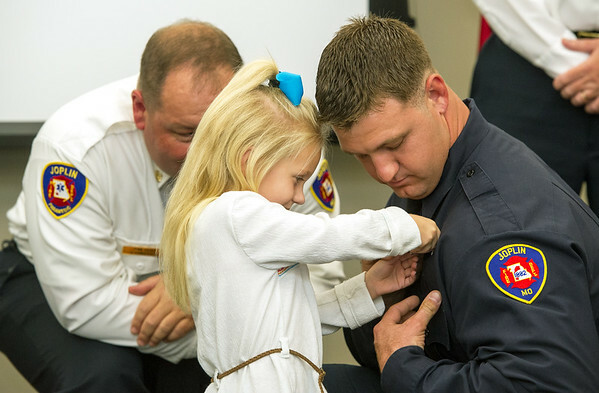 Lillyann White pins a badge on her father, Daniel White as Joplin Fire Chief James Furgerson looks on during the Joplin Fire Department's Recruit Graduation and Promotion Ceremony on Friday at the Joplin Public Safety Center. White was one of five new firefighters who completed their training and will begin service to the community. Other graduates are: Baylor Smith, Kent Shouse, Davis Martin and Jason Levi McBryde - a second generation firefighter.